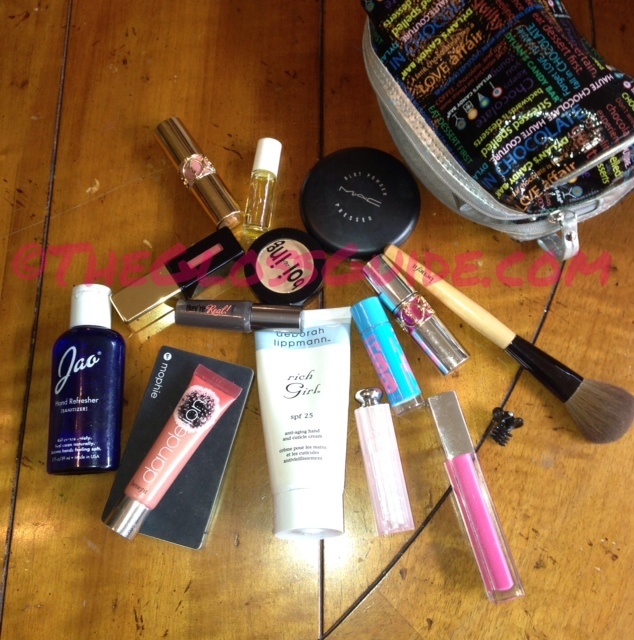 Ever wanted to peek inside this gal's makeup bag? Well, now here's your chance! My sweet friend was kind enough to share with us some of the makeup she totes around on a daily basis! Jao Hand Refresher (Sanitizer) get it here! Deborah Lippmann 'Rich Girl' Hand Cream SPF 25 get it here! Benefit Dandelion Ultra Plush Lip Gloss - Soft Pearly Pink get it here! Benefit They're Real Mascara get it here! Benefit boi-ing Industrial Strength Concealer get it here! Benefit Blush/Powder Brush get it here! YSL Rouge Volupté Shine: 15 Coral Intuitive get it here! YSL Volupté Sheer Candy Color: 04 Succulent Pomegranate get it here! YSL Rouge Pur Couture Color: 27 Pêche Cerra-Cola here! Dior Addict Lip Glow get it here! MAC Pressed Blot Powder get it here! Maybelline Baby Lips Lip Balm in Quenched get it here! Mophie iPhone Charger get it here! Hope you enjoyed this! Many thanks to Em for letting us sneak a peek into her little bag of tricks. We clearly both have an unhealthy lip gloss addiction! When in doubt - pack them all! I remember one of the first glosses she got me HOOKED on was Too Faced - Girls On Film. What a gem that was! Oh the things girls bond over. Emily now has her very own blog to share more of her beauty secrets with you, as well as fashion and lifestyle. Let me tell you - you will LOVE it! Please go visit HERE now and show her tons of love.